Bryan Eshleman from Kernersville, NC came from behind to win the Third Annual D-Day Weekend Breakout Normandy tournament in Hunt Valley, MD during Veteran's Day weekend as 18 vicarious generals hit the beaches 42 times to decide the championship. Bryan had twice made it to the Breakout finals at WBC only to have to settle for second, but he was not to be denied this time. However, he owes at least part of his championship to Mark Gutfreund of Paducah, KY who bested the last unbeaten player, Marvin Birnbaum, in the final round. That win allowed Bryan to emerge as the best among four equals tied at 4-1 based on a Strength of Schedule tie-breaker. 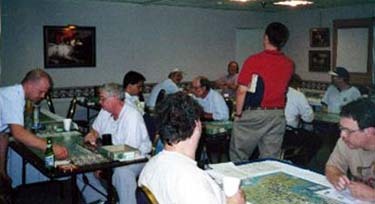 Birnbaum's attempt to run the table fell short when he was unable to repeat cliffhanger comebacks that saw him defeating Jim Doughan and Bryan Eshleman with dazzling come-from-behind victories with each side. The 1999 WBC runnerup had to accept bridesmaid honors again when Gutfreund's German defense could not be penetrated in the final round. The competition was exceedingly tough as the GM's four favorites to win the tournament went a combined 3-8 through the first three rounds. 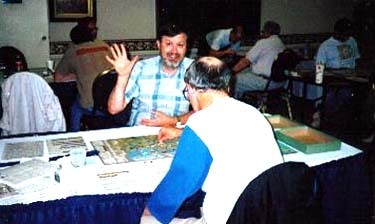 Defending champion Alan Applebaum, who had run the table at D-Day II with only one close call, lost his first two games in down-to-the-wire nail biters against Don Greenwood and Mark Gutfreund, and then withdrew from the tournament exhausted. The key to beating Alan may be forcing him to play the Allies as both Greenwood and Gutfreund bid 20 supply rather than face Alan's German defense. Jim Eliason made an impressive debut in the tournament -- going 4-1 to finish third despite having only about a dozen games under his belt. After falling as the Allies to Bryan Eshleman in round 1, Jim then posted four straight German wins over three WBC champs and the BKN GM! Welcome to the club! With 42 games completed, there are always many interesting anecdotes and memorable battles to retell, but this year's best story had to be the 4th Round battle of the last unbeatens between Marvin Birnbaum and Bryan Eshelman. Marvin, the 1999 WBC runnerup, is known not only for his good play but his tendency to get involved in wild and wooly finishes. This one added a new chapter to his book. During the Dawn Phase, one of the the British paratroop units in Merville tried to silence the Merville CA, but failed in their attempt at 3:3. The other captured the bridge to Sword Beach. The US paratroops captured the 59/50, 50/52, and 50/44 bridges. The naval bombardments went fairly well, with the exception of Sword Beach which failed completely. The CA's at Juno, Sword and Omaha were flipped, as was element of the 709th guarding Utah. On Omaha, the CA and one infantry unit was affected. Then things got ugly. The British air was assigned to Sword and the American to Port-en-Bessin. The RAF did its part - spending the CA at Sword, but the Yanks whiffed - leaving some serious interdiction problems. Bryan had little choice but to designate all available units to come ashore at Sword, and hope for the best. At Juno, Bryan chose to assault with the three regiments of the Canadian infantry division. The three units of the 50th division were designated at Gold. In the American sector, all units except one regiment of the 29th hit Omaha. Utah drew one regiment of the 4th division. Interdiction at Sword was brutal. Five of six Interdiction rolls came up 1. The armor unit, all three regiments of the British 3rd Division, and one of the Special Service brigades were interdicted before they reached the beach. The lone surviving brigade did not come up with a miracle, so Sword Beach was officially 'stuffed' with all units at D1. Marvin, however, did take a voluntary retreat with the 716/736 infantry regiment back to Caen. At Juno, things were better. Although, the Canadians did not clear the beach, they managed to inflict two CP on the Spent CA, taking him to D2. On Gold, the British 50th managed to clear the beach. But disaster was waiting on Omaha. Despite the presence of two interdicting CA at Omaha, only a Ranger unit was Spent before the beach assault. Unfortunately, the 12:9 assault went in the German's favor. At that point Bryan was looking at having both Omaha and Sword Beaches stuffed. So, in spite of the low probability of success, Bryan felt the game would be a disaster if he let the roll stand. Tthe Advantage was handed to Marvin, but the reroll was no better, and all the American units on Omaha went to D1. Ouch! The successful assault on Utah, which D2ed the battalion of the 709th was small consolation to what was looming as an Allied disaster on the beaches. As this was the third round of the day, Bryan was more or less gladly envisioning a quick end to this slaughter and perhaps some much needed rest before the last round on Sunday....not to mention the 6 1/2 hour ride home to North Carolina. Looks can sometimes be deceiving, especially in BKN. There would be little rest before the next day. On impulse 0, Marvin moved the 21 Panzer Flak and Pak out of Caen to Bretteville. The 'normal' German opening impulse. That was about the last normal move of the turn. Bryan cleared Utah but failed to take the St Mere bridge on A0. Marvin blew the Gold and Juno bridges into Bretteville on G1. Bryan rebuilt The Gold bridge on his first try on A1 and Marvin failed to seize the "magic" bridge on G2. Bryan knew he had absolutely nothing to lose by taking some chances, so he brought in the British 8th Armor from the Gold Beach Approach and sent him to Bretteville at 7:5. The dice came up big time as the result was enough for an overrun. Since the armor unit would be able to exploit into one of the VP areas, Tilly or Villars-Bocage, Marvin opted to use the Advantage for a reroll. The reroll again resulted in an overrun, the British armor exploited into Tilly, and the weirdness was in full swing! Bretteville was British controlled, but empty. The British armor in Tilly was out on a limb, but the immediate concern for the Germans was the 56th brigade waiting to come on. If allowed to pass through Bretteville, 56th brigade could capture either Villars-Bocage or Caumont, both worth 1 VP. Marvin opted to move the 192nd PG regiment of 21st Panzer out of Caen to Bretteville, and seized both the Gold and Tilly bridges, leaving only the Spent regiment of the 736th infantry to guard Caen. This move effectively blocked 56th brigade, but left Caen vulnerable to assault. On his next impulse, Bryan activated the Juno Approach and brought in the Canadian armor, which overran the D2 CA on Juno. With just enough movement points left, the Canadians moved to Caen and assaulted at 7:6. The dice yielded an overrun, as both players took a moment to get their bearings as to what had just transpired. The Allies had gone from concession to five VPs in a space of two impulses! Marvin, hoping to cut off the reinforcing 56th brigade attacked out of Bayeau at 3:6 and lost, blowing the bridge behind him on G4. On A4, Marvin reinforced Caen with the 56th but gave the shellshocked Marvin a glimmer of hope with a weather change. On G5, Marvin counterattacks Caen with the PG in Troarn supported by the 21st Artillery at 6:8. The dice roll is 8:2 - the 56th retreats D2 to Juno while the armor hangs on at D1. Bryan lands the last regt of the 4th and attacks the St Mere bridge at 6:8 but loses on A5. On G6, Marvin hurls the 22nd Panzer into Caen @ 4:6, trying to dislodge the disrupted Armor but fails and the day ends on the next impulse. But the struggle for Caen is not over. On the first impulse of the 7th, Marvin throws both regiments of the 21st PG back into Caen with artillery support @ 8:9. The allies provide one last thrill in this crazy seesaw affair by rolling snakeeyes, but the Germans have choked with a roll of 3 for a stalemate. The CA on Sword had to take isolation rolls on June 6 and 7. The first roll was equal to the isolation number, so the CA lost a step. On June 7, the roll was less than the isolation number causing Sword to surrender. These results lead to a desperate stand in Bayeaux and a series of risky counterattacks. In all, 20 German units eventually left Bayeaux at D2 before the 12th with another nine units mangled holding the area on the 12th. German counterattacks by 12ss were sucessful in recapturing Tilly and Bourgebous after they had been cleared by the allies. Bryan was never in a position to take Bayeaux with even dice because of the repeated failure of his bombardments. On several of his attacks a +4 or 5 roll would have cleared the area but he never got the break. His bombardment strategy consisted of a naval gun, air, followed by one American and two British corp artillery, then a large British assault. The Germans would move in reinforcements, and Bryan would continue bombarding with American divisional artillery till the day ended. The result was that even on his worst days, the Germans never started with more than three fresh units in Bayeaux. Marvin would throw every unit, no matter how valuable, under the allied guns and watch them go to D2. He also placed artillery in Foret and Tilly to try and reduce the Brit kill stack although this only worked once when a lucky pop took out four infantry. In the end, Marvin was able to hang on to both Bayeaux and Carentan, thus negating the loss of Caen. He also was able to force the British armor in Tilly to retreat before Bryan could link up and reinforce while holding the Advantage to the end. Mark Gutfreund, the hero of the fifth round, stays in the running with a win over Rob Beyma in Round 4.